Chickens like to take baths. Not with water, though. (trust me, giving a chicken a water bath is not the best way to spend a weekend afternoon-as we learned from bathing chickens for 4H) The next best thing is to create an area in your run or coop for your chickens to dust bathe. Chickens like to take dust baths. They will find some loose dirt, dig a space, and lay down. Then, they will roll around, kicking up the dust onto themselves. The first time you see it, it can look like the chickens are convulsing. Or dying. Or both. The chicken can spend up to 20 minutes in the dust bath, rolling about and chilling out. In the summer months when there is plenty of open dirt, chickens can easily make their own dust bath area. We sprinkle some DE (food grade) where the dust bath holes are. It’s easy to find them. They are huge holes, easily fitting 2-3 chickens in them at once. Our chickens will also go back to the same place time after time to dust bathe there. Sprinkling some DE in that area helps to keep lice at bay, and helps to get rid of them if they are infested. See more on that here. So, how do you make a dust bath area in the winter? What will help the chickens stay healthy and happy when the ground is covered with snow and ice? Simple. 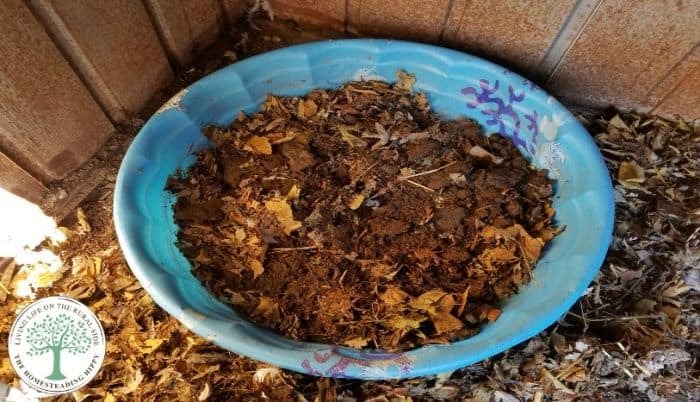 A broken or old kiddie pool. We use broken ones that once served as pools for our ducks. This helps to recycle what we have, keeping our garbage down as well as keeping all our flocks happy. Place the kiddie pool in an area where snow, rain, or water will not be able to get to it. Or at least not much. Our “barn” isn’t very water tight on the inside, but it works. We put the kiddie pool close to where the chickens roost and where their food is for easy access. Add 3-4 shovels of loose dirt. Sandy, loamy dirt seems to work best for us, as it doesn’t get packed down as quickly. We also add some dry leaves between each dirt layer. This helps to keep the dirt aerated. Add a generous sprinkling of DE (find it here from my affiliate partner) on top of the dirt, and watch your chickens clamor for their new “spa” area! This dirt WILL get disappear over the course of the winter as the chickens push it out during their bath. When this happens, we rake up the dirt and add it back in as much as possible. You can also add a bag of topsoil from the local home improvement store if you would like to keep the dust bath area more full. What do you do to help keep your chicken flock happier in the winter? Do you make a dust bath area for them or will you try it now? Be sure to pin this for later! We heat with wood in the winter here. It is also so cold here in northern Canada that we have to keep them inside from Nov to Mar if we are going to get eggs in the winter. So space is limited. We allow aprox 5 sq ft of floor space per bird. What I have done for years is put cold dry wood ash in 1 of the nest boxes. They must be using it for dust baths, because we have to top it up periodically & they never lay eggs in it. They still dust-bath outside & in the deep litter/compost some. But we have never had any sign of lice problems. adding wood ash is a GREAT idea!